Have I ever mentioned that pineapple is my favourite fruit? I think there is nothing quite like this fruit. Well, every fruit is unique in that regard. 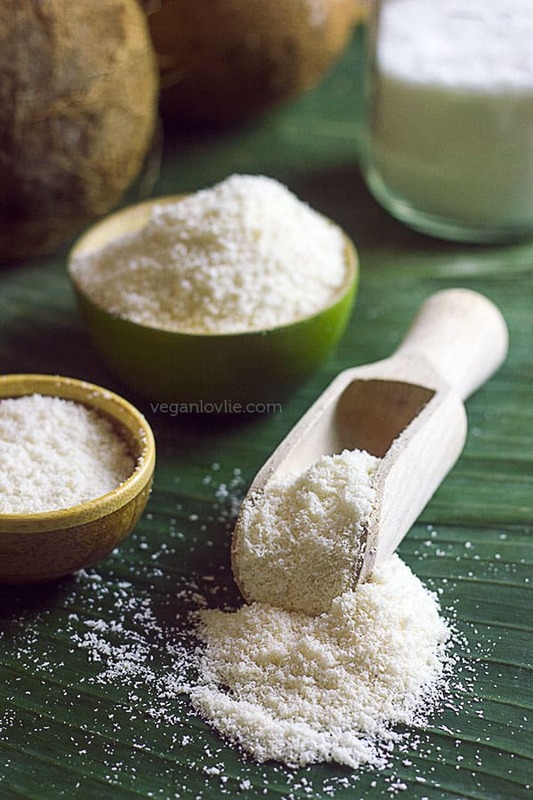 However, pineapple is one fruit that I really enjoy eating in so many different ways — just plain raw being how I like it best. In Mauritius, they are often sold already peeled and carved with the eyes removed. My dad, who own a fruit stall at the market, would always bring a couple of pineapples home every Sunday. It was almost a tradition and for that reason probably Sundays were my most cherished day of the week as a child. We would sometimes make a quick fruit pickle with pineapple, mango and cucumber spiced up with some green chillies. But most of the time I liked my pineapple just plain, cut along the length with the leaves trimmed but still attached to make a small handle to grab on to. The pineapples that we used to get were smaller and hence the stalk could hold the fruit. I first learnt how to peel and carve a pineapple from my dad whom, for his passion for fruits, seemed to take a lot of joy and patience to teach me the ways. My dad, being a very meticulous person, has a real talent for peeling a pineapple for minimum wastage as well as maximum aesthetic. I think I never mastered this art, as I like to see it, quite like him. Nevertheless I passed on what I had learnt to other people, including Kevin who now is perfectioning his pineapple peeling skills in his attempt to impress the old man! 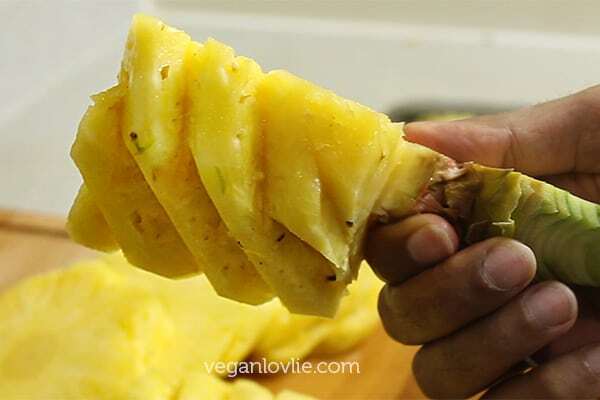 The most popular way that we peel a pineapple in Mauritius is to first trim off the leaves. 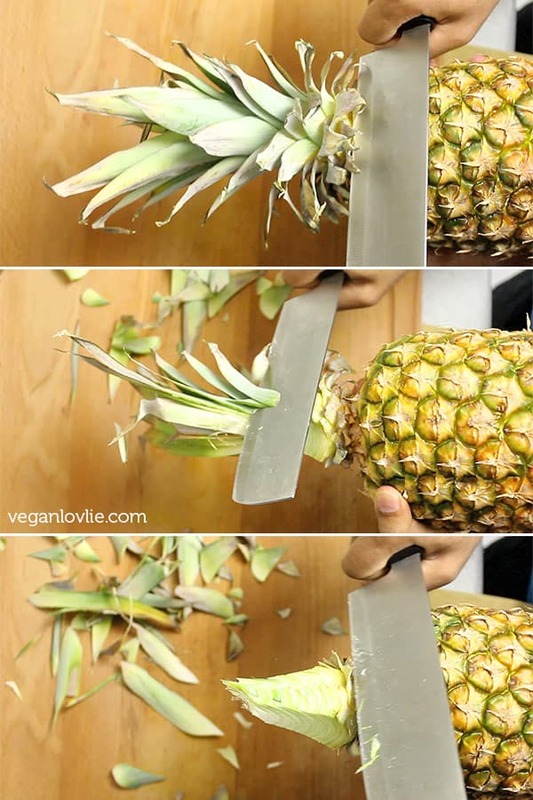 Well, if you are thinking of saving the tops to grow another pineapple, then this method makes them unusable for that purpose. But the reason why the leaves are trimmed is to create a sturdy stalk that is used to hold the fruit while peeling and then eating it. 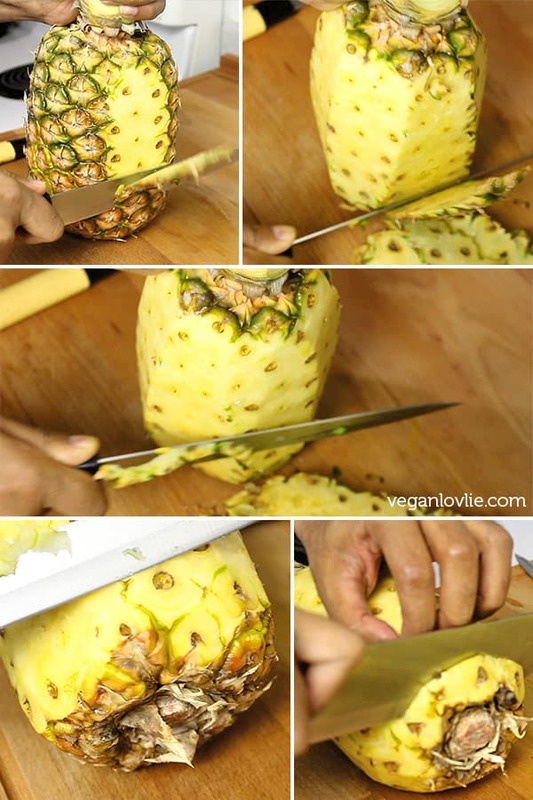 Then, place the pineapple standing on a board and begin peeling the skin in sections working from top to the bottom of the fruit taking care not to take too much of the flesh. The eyes should be visible. 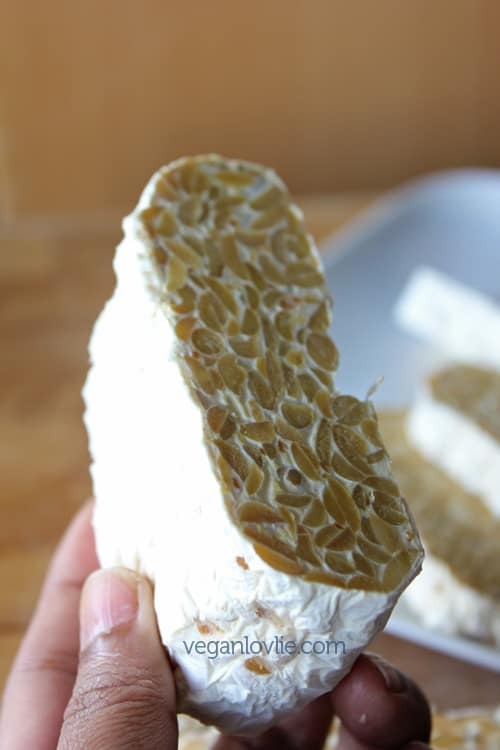 Remove any skin around the curved areas and take a slice off the bottom to remove skin and stem underneath. We usually carve the eyes out by running the knife on each side of them to remove them. Notice that the eyes run parallel along an angle all around the pineapple. The best line to follow is the one that goes along a lower angle and will make the longest curve around the pineapple. Along this line, all the eyes are perfectly aligned. If you have a look at the other direction, you’ll notice that the eyes are aligned at a steeper angle and there may be a few odd ones that do not seem to be aligned to any other one. So, make sure you choose the lower angle line to start carving. The end result will also be visually more appealing. 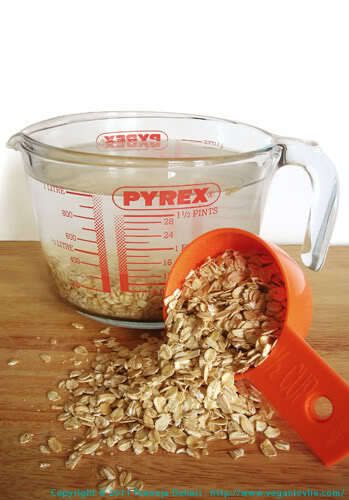 Start by inserting your knife along one row of eyes at an angle so that your knife slides underneath them. Then insert your knife on the opposite side of the cut to make a ‘V’ incision to remove the eyes. 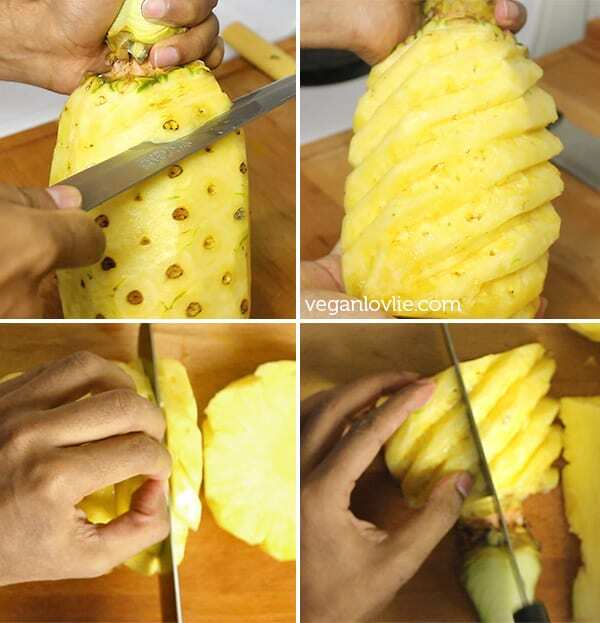 Do not cut too deep as you will defeat the purpose of cutting a pineapple in this way to avoid wastage. Don’t try to cut too many at a time, work in columns, then turn the pineapple on itself and continue like so until you’re done. Once carved, you can slice the pineapple in any way you like and serve. 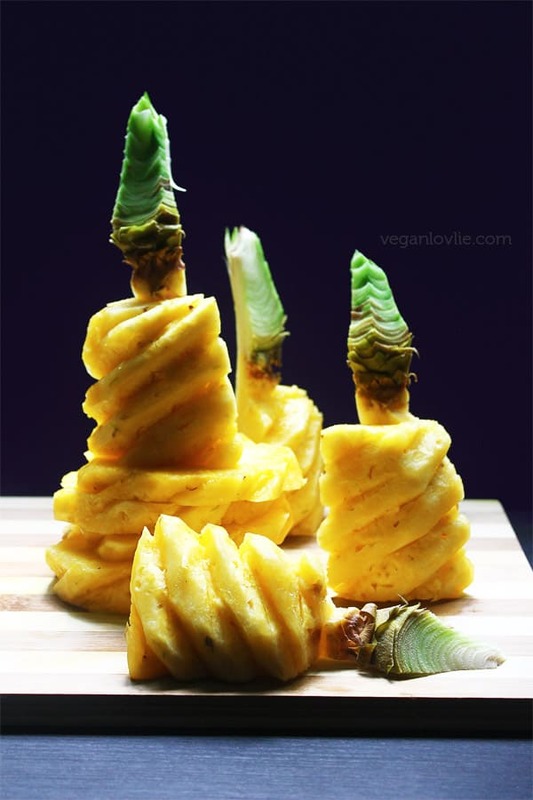 If you want to present the pineapple with the leafy stalk, you can cut it along the length into quarters like I mentioned before. 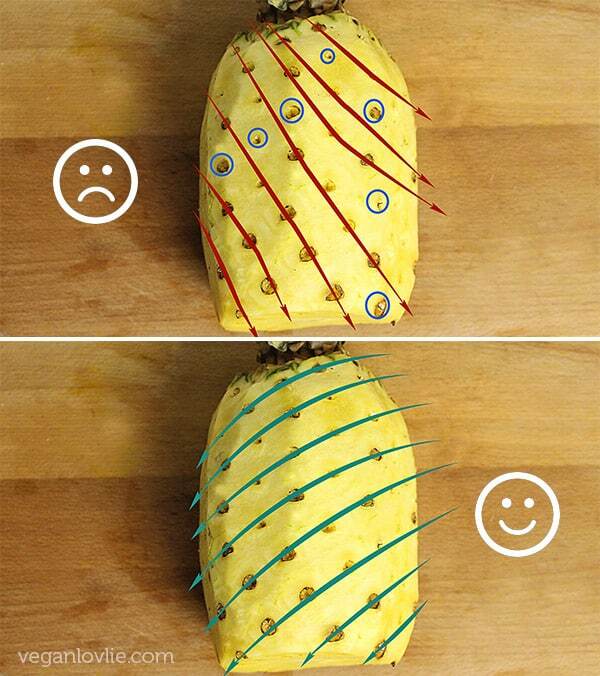 For larger pineapples, you may want to chop off a section across the width to reduce the length and hence the weight and then cut along the length. In any case, you’ll be able to enjoy your work of art and some delicious pineapple. And as this has become the usually thing on this blog, I think a video would explain this much better than words would do. So, enjoy the video tutorial by Kevin. This is a ‘pinnable’ just in case you wanted to save the steps all-in-one.